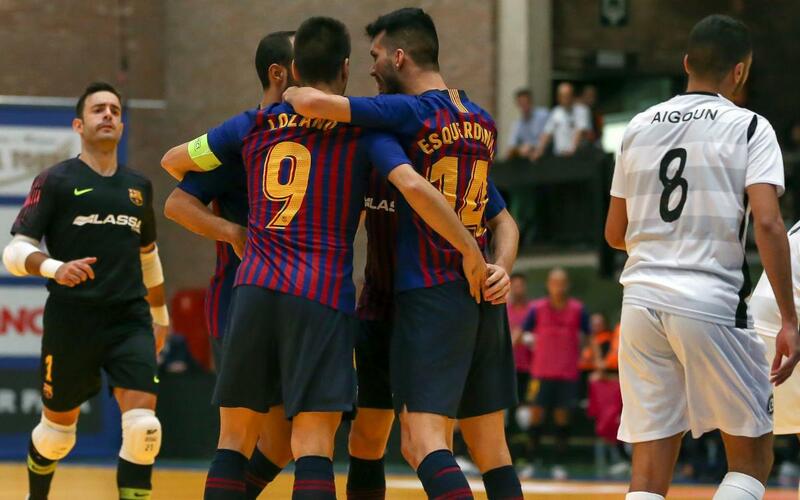 Barça Lassa futsal have started well in the UEFA Futsal Cup. Andreu Plaza’s side travelled to Halle in Belguim to play in the Main Round and they debuted with a victory against Kremlin Bicêtre (4-2). The game was tough and they had to play very well to secure the victory with three goals from Ferrao and one from Esquerdinha. Barça went 2-0 early on thanks to a double from Ferrao after four minutes, Kremlin didn’t give up and they managed to cut the deficit t one goal thanks to Aigoun two minutes before the break. Barça Lassa had chances of their own through Adri Ortego and Esquerdinha but were unable to make it three. Then the home team levelled through a Roger own goal in the 33rd minute. The blaugranes didn’t let this affect them and they took control of the game as Esquerdinha, following up from a Lozano shot, made it 3-2 a minute later. Finally, Ferrao added the fourth with three minutes to go to secure the 4-2 victory. The win and three points means that Andreu Plaza’s players will go into their game against Benfica on Thursday with confidence.